A few weeks ago on Friday afternoon, I took a drive down the 10 from my NELA (Northeast LA) neighborhood to visit the Band of Vices gallery located in West Adams to view Chelle Barbour’s first solo exhibition “You Is Pretty!” Surrealism and The Black Imaginary curated by Angela Bassett. Band of Vices gallery is located on the corner of West Adams and Burnside Ave in the beautiful West Adams neighborhood. I admittedly don’t get out NELA or Downtown much these days. The amount of new restaurants and shoppes popping up in my own neighborhood makes it so easy to stay in my hood. I grew up in the Inland Empire and don’t know very much about the history of West Adams so I consulted not only the internet and some folks I know for more info on this beautiful neighborhood full of Craftsman homes and public art. After some research, I found out that West Adams is not only one of the oldest neighborhoods in LA (most buildings were built between 1880-1925) but also was one of the wealthiest districts in the city. Its streets are lined with Craftsman and Victorian homes that once housed some of the wealthiest people in LA. At around 1910, when Beverly Hills and the Westside started developing, West Adams saw a shift. By the mid 20th century, white flight was in full effect and West Adams became a hub for affluent Black Americans. The area was home to notable Black celebrities such as Ray Charles, Johnny Otis, Marvin Gaye, Hattie Daniels, Paul Williams and Sugar Ray Robinson. Band of Vices co-owners Melvin A. Marshall and Terrell Tilford opened Band of Vices in May of this year (to a sold our show by artist April Bey, no less). In its first year, Band of Vices has committed to showing emerging and mid-career women artists of the African Diaspora (April Bey, Sharon Louise Barnes & Chelle Barbour). Tilford and Marshall are not at all newcomers to the art world, Tilforld holds a Masters from Rutgers and Marshall is currently on sabbatical from a PhD in Art History (he is the former Chief Curator at MoCADA in Brooklyn, NY). While Band of Vices is the first gallery they’ve co-owned together, they have worked together curating exhibitions in LA, NY and Oakland for almost two decades. The intentionality of the space is palpable upon walking into the gallery. Tilford grew up in this neighborhood and has spoken before about the importance of pushing back against the gentrification happening in West Adams. Two Black gallery owners intentionally installing shows by artists who are Black women in their inaugural year makes a strong statement of that intentionality. Especially when so many people of color are currently being displaced from their neighborhoods here in Southern California. Currently on view in the gallery and what I intentionally went to visit the gallery for is work by artist Chelle Barbour. 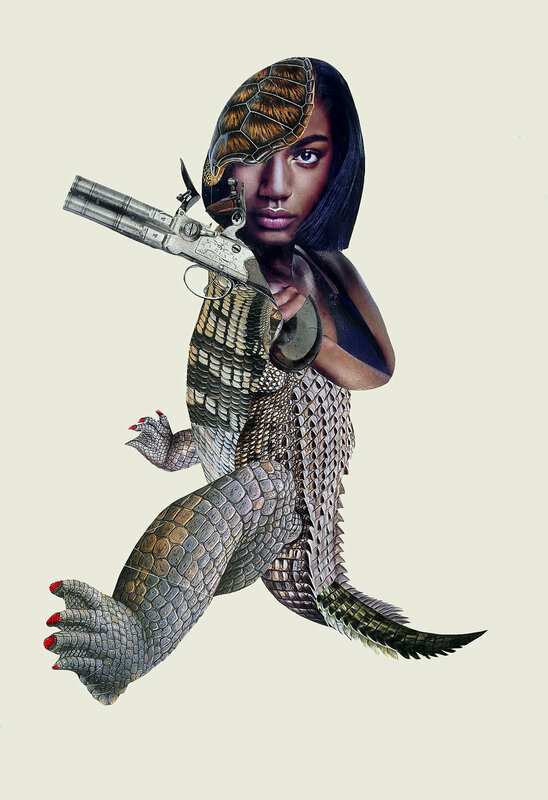 Ms. Barbour’s work for You Is Pretty takes images of Black women in print and re-configures them, using collage to create beautiful Surrealist and Afrofuturistic images. In her work, we see Black women centered, elevated, armored and adorned. The show is guest curated by the Matriarch in the record setting film Black Panther, Angela Bassett. My first thought while interacting with the work in You Is Pretty, my first thought was “Octavia Butler!”, then my thoughts went to the work of folks like Ayana A. H. Jamieson & Moya Bailey for the Octavia E. Butler Legacy Network, Alexis Pauline Gumbs, adrienne marie brown and Kim Katrin Milan. The common thread for me in the work of the folks mentioned (based on my own interaction with their work) is that they invite us to not only imagine but work towards a world where we are all free. In that work we MUST center the freedom of Black women. Ms. Barbour’s work for You Is Pretty, gives us a visual for that future that Vibe spoke of. Textures, adornments, joy, fierceness, love, rage, protection and metamorphosis. Each piece in the show commands respect. It pulls you in to interact with it daring you to step closer to take in the details and intricacies. The body of work flows together without competing with each other. A visual representation of the saying “Queens see Queens”. In her video On #Selfies, Shame, Self & #Community Love, Kim Katrin Milan states: '“There's so many different reasons why artists throughout history have chosen to record people. And you know if we look around in museums all over the world, we'll see the people who normally get represented. And they're normally not womyn of color, they're normally not trans womyn, they're normally not men of color...they're normally the same kinds of people that get to be commemorated in museums, in art galleries, in film, on most magazines, in most books.” Other than interacting with the pieces in You Is Pretty, what was the most refreshing to me was being in an art space for an afternoon and not having to interact with whiteness. The gallery is Black owned in a historically Black neighborhood and the art on the walls featured all Black subjects. When going to other art institutions in the city, I am forced to interact with whiteness in order to get to the few pieces that include people of color and/or Black folks and even when I find BIPOC (Black, Indigenous, People of Color) in the art, rarely are they relegated to positions of royalty and strength as they are in Ms. Barbour’s work. In the exhibition essay for You Is Pretty, Melvin Marshall writes “…In these collages, Barbour is arguing on behalf of black women for their genius, their humanity, their beauty, their dignity, their intellect, their independence, their curiosity, their imagination and the endless possibilities that these qualities engender regarding their very existence.” It is time for those of us who are NOT Black women to take a step back, listen to Black women, let them lead by giving them positions of power and trust their brilliance. Our existence literally depends on it. Extra!!!! In much gratitude with Mr. Melvin Marshall from Band of Vices for this very last minute interview which he graciously granted me the day I went to visit the gallery. I apologize in advance for the sound quality and the fact that it’s unedited. I really wanted to make sure it accompanied this piece. Let me know what you think! Many thanks to Alyssa Hernandez-Navarro & Allison Simon for research assistance on this piece.